With our many years experience of planned and preventative maintenance programmes, we have spent a lot of time working on the HVAC system for hotels. We have seen major changes in both the design of the systems and the demands from our customers. For the hotelier, this is driven by the changing expectations of their paying customers. The requirement from almost any respected hotelier is for the perfect harmony of a simple, non-intrusive installation, exceptionally low running costs and minimal ongoing maintenance issues. Traditional hotel air conditioning systems were generally NONE of the above. Installation of new or, alteration to existing air conditioning systems normally meant a complete shut down and decommission of the system. It probably meant a hotel closure because of the disruption and it also incurred heavy if not visible retrofit pipework installations within the building. Running costs were comparatively high as older systems were so inefficient, compared to their newer rivals, that ongoing running costs can be reduced by between 20-40%. Maintenance is also fast becoming a major issue with traditional systems. The onerous EN378 directive now means that in a system where even small amounts of refrigerant exist within the hotel room (and some office environments), leak detection must be added. The reason for this is that if there is a leak and the refrigerant is released into the room, there is a critical risk to the customer. Leak detection is a legal requirement. This makes sense, but in installation terms could add a minimum of £20,000 to the capital outlay for the average 100 bedroom hotel. It also brings the additional cost of maintenance of every unit to continue to comply with regulations. There is also the elephant in the room in the shape of the new minimum energy efficiency standards (MEES). These came into force in April 2018 and now mean that any commercial building cannot be sold or rented if it has an EPC (Energy Performance Certificate) rating of F or G. With air conditioning being one of the largest energy consumers within a hotel, it’s also one of the easiest ways to deliver the savings to make the building or the business saleable. Taking all of this into account, any system, however new or old, efficient or inefficient also needs to be able to meet the needs of occupant comfort. This has to be a priority as guests are very quick to complain of they are too hot or cold. This all sounds like quite a challenge. HVRF or Hybrid Variable Refrigerant Flow systems combine both traditional and innovative methods of cooling to allow hoteliers and others to improve efficiencies and lower ongoing energy costs. How does an H-VRF work? On the surface, the system looks quite similar, but underneath there are major differences. 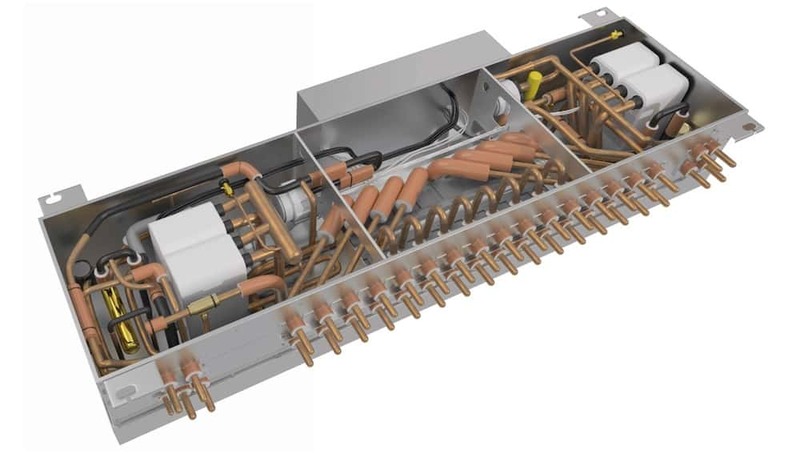 At the centre of the system is the Hybrid Branch Controller (HBC) which is connected to the outdoor heat recovery unit via traditional refrigerant piping. Energy rich refrigerant enters the HBC. The HBC is a heat exchanger. On the secondary side of the heat exchanger is the evaporator where water flows in and collects the energy to deliver it to the room fan coil or calorifier. 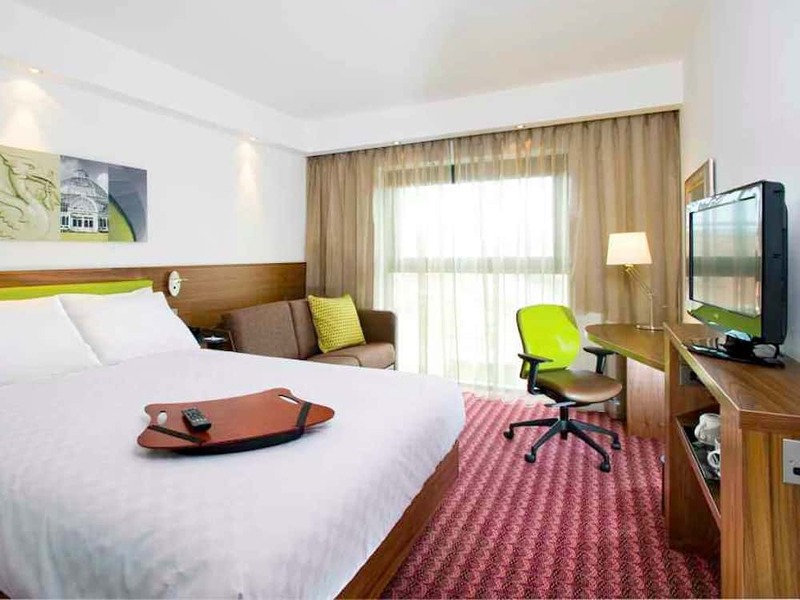 For hotels, which often require simultaneous cooling in some spaces and heating in others it delivers the efficiencies they need with benefit of flexibility for the customer. The HBC acts as the brains to the system. The outdoor unit delivers a mixture of liquid and hot gaseous refrigerant to it. This mixture passes through a plate heat exchanger to heat water by condensing the gas and then the liquid refrigerant passes to a second plate heat exchanger to provide cooling. The key difference between a more traditional VRF and the newer H-VRF system is that in an H-VRF system, the need for leak detection is removed entirely as it uses water in place of refrigerant in the occupied spaces. Therefore any risk to occupants and property under the EN378 guidelines are removed. With F Gas regulations becoming more strict, there’s also the benefit that the H-VRF uses both 30% less refrigerant than a traditional VRF and is entirely R32 compliant. This means that your system is potentially more future proof from the outset as it doesn’t use the soon to be outlawed R404a or R410a refrigerant gases. There are other major benefits too. With a water based system it is possible to add to the system using a modular approach. There’s no need for a full decommission, just a valve to shut off the part of the consumer side system that isn’t yet operable. This means you can install the system, almost on a room by room basis, whilst leaving the old system in place. This makes it ideal for ongoing refurbishment work as business interruption is kept to an absolute minimum. As the consumer side system is water based, the pipework is much simpler too. It can be installed with continuous, pre-insulated plastic piping for speed and cost effectiveness. With it being a two pipe system, it can also be installed where space is at a premium. This makes it particularly applicable for listed buildings, but just as relevant for new build applications – even those built using a modular construction technique. So that’s it. In a nutshell, Hybrid technology is here and it’s the perfect HVAC system for hotels. The Kimpton team have the expertise and experience you need as your HVAC partner. Whether it’s maintenance, refurbishment or a new build you’re looking at, call us today to discuss your requirements on 0151 343 1963. Keeps all of the major plant external to the building and can still be delivered up to 60 metres from HBC.